Donald Trump’s rise to the presidency has not only yielded contention and protest in the US. In Denmark, the controversial new leader of America has also drawn a response. 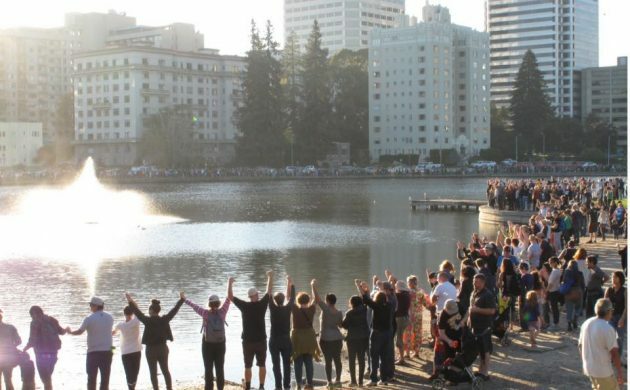 It is “inspired by the peaceful protest at Lake Merritt in Oakland, California: Hold hands around Damhus Lake”, the event organisers wrote on Facebook. However, at the present time, with just two days remaining, the organisers may struggle to complete the ring as only 23 people have signed up on Facebook to attend – with 93 showing interest. In comparison, thousands of protesters turned up for the protest in Lake Merritt in Oakland, California and easily managed to complete the ring around the 5.4 kilometres of shoreline. Damhus Lake has 3.6 kilometres of shoreline. Perhaps Peblinge Lake – one of the five City Lakes in the centre of Copenhagen – is a more realistic venue with its 1.6 kilometres of shoreline. Damhus Lake is located on the outskirts of Copenhagen. Running alongside Roskildevej, it is located close to the suburbs of Rødovre and Vanløse and the enclave of Frederiksberg. To get there from the city, cycle to the zoo, carry straight on, and after approximately three kilometres it will appear on your right.